Is wearing high heels really bad for your feet? 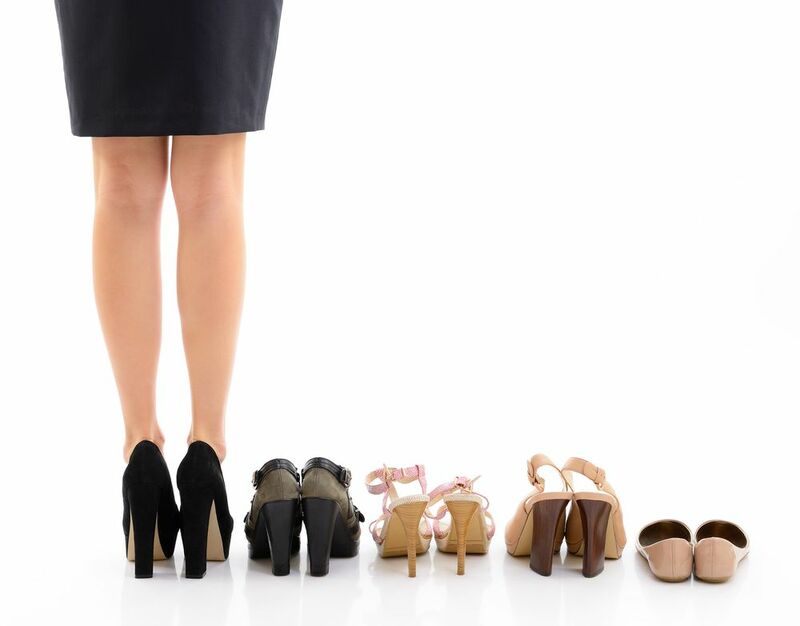 “Are high heels bad for feet?” is a fairly common question women ask at our office. Some women wonder this after spending extended periods in stylish stilettos. Others have heard that high heels cause bunions and are curious about the connection. There is debate in the medical community over whether shoes cause bunions and bunionettes or not. At the very least, it is safe to say that they can contribute to making the condition worse. Other problems high heels can contribute to, or even cause, include ingrown nails, calluses, and blisters. Additionally, high-heeled footwear can affect Achilles tendons, shorten muscle fibers, and reduce the range of motion in ankles. These factors all can play a role in a host of foot and ankle conditions that may ultimately cause pain or impede an ability to perform favorite activities. All of this said, wearing high heels on special occasions is probably not the worst thing in the world, but be sure to place the emphasis on “special.” For additional information on the effects of high heels or to receive expert foot care, contact Austin Foot and Ankle Specialists online or by calling (512) 328-8900. Spotting signs of skin cancer early is vital to treating this possibly dangerous condition. Basal cell carcinoma appears as a waxy or pearly bump, or brownish-colored flat lesion. Squamous cell symptoms include a red, firm nodule, or flat lesion with a crusty surface. Change is the most important thing to look for when spotting melanoma. A new mole or a difference in size, shape, or color of an existing one is a sign to seek treatment. Remembering ABCDE will help you to recognize symptoms quickly. You should check yourself regularly, and if you notice any of these signs, contact our Austin, TX office right away. Stop skin cancer before it becomes serious. Make an appointment with Dr. Craig H. Thomajan DPM, FACFAS by dialing (512) 328-8900. Patients who searched this also found What to Know about Sunscreen Options helpful. What are the causes of plantar fibroma? Ouch! Is that what you say every time you take a step? You could be suffering from plantar fibroma—a painful, fibrous knot in the arch of your foot. The causes of plantar fibroma are not clear, but podiatrists agree upon several viable reasons that could play a part in the development of the condition. If you are a runner or participate in similar activities that involve repetitive impact, this can cause trauma to the plantar fascia—the ligament stretching the length of the bottom of your foot. This in turn can result in thickening and tears of that ligament, thus explaining the pain that you are feeling. Another possibility is that you are genetically predisposed to develop the condition. In addition, blood pressure or anti-seizure medications are believed to have a direct effect on the disorder as well. To find out more, call (512) 328-8900 to talk with Dr. Craig H. Thomajan DPM, FACFAS or Dr. Shine John DPM, FACFAS of the Austin Foot and Ankle Specialists in Texas. Most people who have searched this content have also found Causes of Lumps and Bumps helpful. From aqua shoes to FiveFingers styles to minimalist varieties, bare footwear is becoming a popular fad. There are opposing opinions, however, as to the safety of wearing these trendy types of running shoes. The theory behind them is that people have been running for millions of years, historically barefoot or in simple shoes like moccasins or sandals. Some feel that modern day running shoes provide too much control and cushioning, reducing the ability of foot muscles and tendons to strengthen naturally. Opposing views suggest that foot and ankle injuries can be prevented by choosing running shoes with strong stability and support. As of today, the jury is still out on what’s best for the health of your feet. If you are not sure, you should visit Dr. Craig H. Thomajan DPM, FACFAS and Dr. Shine John DPM, FACFAS before you make any purchases. A foot examination may help you decide if bare footwear is right for you. Call (512) 328-8900 or visit the Austin Foot and Ankle Specialists in Texas today. Most people who have searched this content have also found Barefoot Running: True or False? helpful. Tarsal tunnel syndrome (TTS) is caused by feet that are flat and feet that are swollen due to diabetes, arthritis, or other diseases. Cysts, bone spurs, varicose veins, and injuries such as sprains are also related to the compression of the tibial nerve, which results in TTS. The tibial nerve is found within the tarsal tunnel. The tunnel extends between the inner bone of the ankle and a grouping of ligaments known as the flexor retinaculum. If you are experiencing loss of feeling, a tingly sensation, or sharp pain in your foot, TTS may be the culprit. There are noninvasive treatments available, however, early intervention is key to success. Help is just a phone call away at Austin Foot and Ankle Specialists. Dr. Craig H. Thomajan DPM, FACFAS and Dr. Shine John DPM, FACFAS offer effective treatment for nerve related foot and ankle pain. Call (512) 328-8900 today and find relief. Online appointment requests are also available. Most people who have searched this content have also found Living with Diabetes helpful. How does laser treatment for toenail fungus work? Laser treatment for toenail fungus gets to the root of the problem—fast! In fifteen minutes, you’ll enjoy the benefits of fungus-killing focused light that will bring healing to your unsightly nails. Creams, lacquers, and oral treatments are hit and miss. They may or may not reach the source of your crumbling, yellowing nails. In fact, topical nail applications simply can’t get to the hard-to-reach nail bed. Enjoy safe, pain-free treatment for your fungal toenails with Blue Shine Laser Therapy. This laser uses light to reach the source of your infection. In as few as 6-9 months, you can expect a new, healthy nail in place of the old, infected one—now that’s a solution that works. If toenail fungus has you hiding your feet, it’s time to take action. Call Austin Foot and Ankle Specialists at (512) 328-8900 today to learn more about laser treatment for toenail fungus. Dr. Craig H. Thomajan DPM, FACFAS looks forward to helping you end the embarrassment of fungal nails.